Beginning with the Coca-Cola 600, Coca-Cola kicked off a flurry of events that salute service and pay tribute to the nation’s Armed Forces members and the USO’s 75th anniversary (which also marks the 75th anniversary of the company’s partnership with the USO). The activities began with Memorial Day weekend at the Coca-Cola 600. The USO has launched a heartfelt campaign – “Campaign to Connect” – to show service members how much Americans support them. Check out the campaign website and show your support! 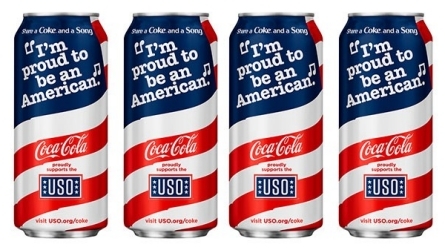 This year’s Share a Coke® and a Song campaign was activated at the race, and limited-edition patriotic cans of Coca-Cola® with the lyric of a song that screams red, white and blue are available in local stores through July 4th. On behalf of Coca-Cola UNITED, we join in remembering those who passionately and victoriously fought to establish the freedoms and liberties we enjoy every day of the year. To the members of our nation’s Armed Forces at home and abroad and to their families, we give honor and our sincerest gratitude for your commitment and passion in serving, protecting and defending our inalienable rights as citizens of the United States of America. Don’t forget to check out the campaign website and show your support!